We’re down to six winners needing reviews now. Slow but…not frequent enough. I’m operating like a somewhat lame (meaning leg hurts) tortoise in getting out these reviews. But that doesn’t diminish the quality of the winners. There is no particular order to the reviews except that the Elite winners get first dibs. Today, we have two non-competitive but related by marriage companies. Both of them are in the newest part of the sales market – sales enablement or, if you prefer, sales optimization. They are each among the standard bearers for their market – and each of them is expanding their offerings in a new – though related – direction. That would be InsideView for sales intelligence, now expanded to marketing intelligence and Xactly, sales compensation, now expanded to data services. More on that for each later. What’s interesting about the market they represent is that it is one of the least known and yet best evolved markets with some pretty sophisticated technologies appearing frequently. Several companies like our two winners and others like Elite 2015 winner PROS are part of this market but they don’t compete. What is the market, you ask? Why, thank you SO much for making it easy for me. I can answer that. One thing we know when it comes to the CRM market is that sales force automation (SFA) –which is what CRM cut its teeth on (and is still mistaken for) — is commoditized. It is mature. It is functionally the same regardless of who provides it to you. I’m NOT addressing the UI, or the depth of the functionally or the process flows or anything but the fact that what comprises sales force automation is pretty much the same from application to application. It is opportunity management, account management, pipeline management, contact management, and depending on how you view demand generation which falls in between sales and marketing, may even include lead management. But that’s the sum and substance. It’s why applications with that particular functionality are called SFA in most circles. That said, the new wave of sales related applications are pretty much designed to be incremental to significant value adds – the types of things that perhaps increase deals closing success rates by 1 percrent or increase up sales and cross sales by 3 percent or increase the number of repeating customers by whatever. Companies like InsideView provide quality intelligence from both structured and unstructured data sources; like Xactly provide compensation management to increase the likelihood of salesperson happiness and thus success. Those that are happy tend to be more successful, n’est ce pas? The technology optimizing sales opportunities with these value adds again. That’s proven by our two winners – Xactly and InsideView. Both of them started on the sales side as specific sales enablement/optimization capabilities of an entirely different sort – and both have expanded their offerings – InsideView broadly (more later) and Xactly deeply (more later). Both have done very well over the past few years. Both have had market impact of one sort or another – each in a different part of the market. 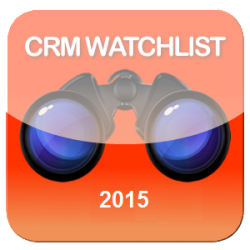 And, of course, both of them are CRM Watchlist 2015 winners. Time to peek under the covers and see what’s with these two champs. I’ve known InsideView since before they could even cut their teeth. I always knew they were going to grow up good and muscular and, even with some teenage angst along the way, were going to be smart and successful. They’ve borne this out. For those of you who are unclear on what they do, it’s pretty straightforward. They provide market intelligence focused on sales and more recently marketing that can provide their subscriber companies (nearly 20,000 at last look) with the kinds of information they need for all kinds of reason – competitive, analysis, industry knowledge, pretty much whatever you want. What makes them standout is their algorithms – they run and then somehow, with the magic of mathematics, find you the information that you need that is actually valuable to you. Do you know how rare that is? This isn’t just stuff thrown against a wall or undifferentiated search engine corn mash bill. This is highly useful, personalized data. I have a subscription that they gave me years ago that I keep up – and I get two emails a day (one for each of two topics) and I would say about 75%-80% of the information I get is very useful to me. I think the interface could use a little work, but given the value I get, that’s almost niggling. But note I said almost. But this isn’t about their products only – this is about their company – and it’s a good one. They have a veteran management team led by the almost ubiquitous Umberto Milletti who is not only an experienced highly capable CEO but a truly good guy. The amount of experience on the team as a whole probably encompasses the bulk of the lifespan of humanity as a whole – or maybe not that much except metaphorically but you get the idea. They know what they are doing and have the experience and knowledge and smarts to both do it and prove that they got it done. But that alone isn’t what distinguishes them – and arguably has made them the market maker in the sales/marketing intelligence field. What does distinguish them? They understand their place in the ecosystem and build according to that. They have done everything they’ve done with their customers and, in their case, oddly more importantly (for Watchlist purposes that is) their partners. This kind of purpose situates them well. They are part of other ecosystems. That’s what “helps businesses work” means. They help businesses work, informed. Their output leads to outcomes that makes help businesses make intelligent decisions based on the information they have that leads to insights and that leads to successful business results. They populate other ecosystems as a significant piece that is able to pollinate the ecosystems they reside in. The resulting effect is a fabulous partner network run by VP of Alliances Heidi Tucker. They are integrated with most major CRM applications and have a strategic partnership or two. In bulk, they integrate with Microsoft, SAP, Salesforce, Oracle, NetSuite, Marketo, Oracle Eloqua (marketing), and SugarCRM. Microsoft is a key strategic partner and they are OEMed into Microsoft Dynamics CRM related products. This is the first OEM partnership that Microsoft Dynamics CRM has ever had. It is pioneering. They also have a good sense of where the market is going, something I often find severely lacks in other vendors. This is InsideView’s thinking at its finest. Its why they have been market-leading. However, it is an increasingly competitive marketplace with competition that is coming from older school traditional intelligence purveyors like Hoovers or newer versions of now mature InsideView. They have some things that they need to do – or at least think about – and then do – in order to maintain their position. Some of it is to shore up weaknesses, some of it is a take on their future. Reach out MUCH further – Years ago (that would be Internet decades ago), when they were smaller, InsideView’s CEO Umberto Milletti took the role of thought leader very seriously and went on the road, participating in panels, developing a curriculum for social selling around the idea of a university and making time to see that they both internally and externally engaged via content and by outreach to analysts and attendance at conferences. They still do some of this, but they pretty much are at the same level as they were several years ago. They need to step this up. Think of it this way. They integrate with all the major CRM applications but they never show up at the CRM industry’s premium conference (full disclosure that most of you know: I chair this one) CRM Evolution – where literally all their vendor partners attend in force and more than 20 analysts/influencers with the exception of Gartner in fact, every major firm, independent and boutique group attend. They need to start thinking of supporting the industry they depend on (the ecosystem they participate in) and they need to engage with the influencers on a more extensive and formal scale. Building their own ecosystem – Several years ago, right before they were acquired by Salesforce, Radian6 announced their Insights Platform, a rather brilliant value add ecosystem that had Radian6 social listening tools at its core. But they were able to access the capabilities and provide the value that companies like Clarabridge and Crimson Hexagon – along with, I believe at launch 9 others (eventually 22 or more in total) provided without having to build it themselves. This is something that InsideView can do. Right now, what they call insights is really intelligence that can in some ways lead to insights which are not truly algorithmically determinable. Humans have insights based on the knowledge they can get from intelligence of value to them. InsideView is not a strong analytics player but has the opportunity to tie a number of companies around them that do the analytics – business and competitive and engagement analytics or do the relationship analysis (a good example of this is IntroHive). I’d be thinking seriously about this. They can monetize the model with an Analytics as a Service (AaaS) model. This is a company that has done things right and it is consistently proven by their market lead and market leadership. But the hounds are yapping at their heels now and its time for them to step it up a notch further. Do they have thee chops? I think they do. As I have said before over and over, they won the Watchlist didn’t they? I’ve known Xactly almost as long as I’ve known InsideView though prior to the last couple of years, in a much more peripheral way. I’ve done a bit of advisory work with them and spoke at their conference, but most of my interactions have been as an analyst covering the company and a friend to a couple of folks over there – especially CMO Scott Broomfield. But even as my relationship was not all that deep, I covered them as an analyst because when I began they and arguably Callidus Cloud who have since moved in a new direction were dominant forces in the sales compensation technology space. What intrigued me about Xactly then was they approached compensation not just an application but as an ecosystem that was built around sales – not just people selling but the managers, the system, and the processes – but still with a primary focus on the humans involved. Okay, that’s products and that’s great, but it’s the company that matters really. There is one thing which may be evident in the way I address the Watchlist, but I don’t make explicit that bears saying. In order for a company to be something more than mediocre or at best okay, there are a number of elements that have to be accounted for. But its not just a matter of having those elements, the financial stability, the market reach, the culture, the relationships in the world outside the company, and several others, but those elements have to be woven as a consistent theme into the company’s DNA. That’s what I mean when you hear me say something about a corporate “narrative.” Its not just a story – it’s a living breathing reflection of the company itself. In order for me to assess a Watchlist winner, I’m looking at the corporate narrative. How much the values, vision and mission permeate the day-to-day. So far, you can attribute this though, to the same kind of thing that most companies do. They have these core values, they get their employees to know them, to believe them. But they have an actual program to carry out their core values. They call it VMC2 – vision, mission, customer, community. The program is exemplary and does something that is consistent with what their company provides. Take a guess what it is. At a monthly meeting, new hires are educated to the tenets and the components of CARE and VMC2 by the CEO Chris Cabrera for 90 minutes. There are three forms of recognition: a. X-Factor – awarded to 10% of the company every quarter – the employees are rewarded with a certificate, public recognition, and money. b. Who CARES Award – a quarterly award to 2 percent of the company. It comes with certificate, public recognition, and, amazingly, Xactly stock. c. President’s Award – once a year to 5 percent of the company – rewards unknown. They have a non-profit philanthropic arm called XactlyOne which works in the community and raises money. Organizations from the American Red Cross to Second Harvest and Leukemia and Lymphoma Society are among the many that Xactly supports. Each quarter the management team assesses the program with feedback from the employees in order to make improvements. This is what I mean by a strong corporate culture – as part of a story that can be told that engenders the trust of the employees, the customers and even those who are just aware of the company. The corporate narrative continues via their approach to their partners. They are smart enough to see themselves as participants in a symbiotic ecosystem. Sometimes, the ecosystem goes one way or the other. So for example, Microsoft is at the core of its ecosystem which provides a set of integrated, matrixed applications and service. It isn’t part of someone else’s. Companies like InsideView, while they can and should develop a set of ancillary services around themselves, are best served by being part of an ecosystem. Xactly is closer to InsideView but have a good case for their own ecosystem. So for example, they are integrated with most major CRM systems like Salesforce, Microsoft, SAP, Oracle and SugarCRM – and also are integrated with most CPQ vendors. They are also making inroads with ERP and HR systems (i.e. Successfactors). On the other hand, they have a strong strategic relationship with Deloitte for implementation services which means Deloitte participates in the Xactly ecosystem and vice versa. Theirs is complex but deep. I counted 49 “named partners” that Xactly is tied to – a huge number for a company their size. But, interestingly, while that seems like a ton of investment in a large ecosystem to maintain, I can’t see a whole lot of choices I would disagree with as partners. But narrative continues with their market awareness. That takes two forms. First, there public relations efforts. In 2014 they were mentioned in over 200 articles in a large variety of digital and print publications. They have a keen understanding that they can’t just produce good products, but they have to be known by the marketplace – though there is a noticeable lack that I’ll mention later. Additionally, they are aware of trends. Recently, I’ve seen a significant movement among former software applications companies to expand their efforts beyond just software. Some companies, like Salesforce who probably started first, are moving to platforms (see SAP and Microsoft, among others) and others are beginning to realize that they can do quite a bit with the data they’ve accumulated over the years. So they are beginning to explore what to do with all this data. Xactly has had years of compensation data. As a result, they’ve created a data service that gives companies a way of benchmarking their compensation efforts. This aligns well with a market that is starving for insights and an industry that is deciding on how they intend to provide them. But…they do have a new monetized service, which still has to become a significant revenue producer (it’s on the way) and it’s a market that is changing. So what should they be thinking about to maintain their impact while they establish their position? This little piggy…. – As I mentioned, they have a very deep partnership program with 49 partners. That said, they have little to no go to market strategy with key partners. They need to differentiate their partner program beyond the categories that the partners are slotted to. Go to Market with certain key partners both extends their solution and at the same time, extends their sales reach. Some of the partners would be technology partners and a few would be systems integrators. If they can nail down a couple of larger integrators with strategic partnerships, all of a sudden life, which is already golden, becomes platinum. They also get to stretch their market. Win-win-win…there’s a lot of wins in this one. Extend analyst/influencer relations – Xactly has always had good analyst relations. But it was dependent on pretty much two people – the AR person (the most visible being the since-moved-on Erik Charles, a true artisan) and CMO Scott Broomfield. However, Xactly is at the point in its life where it needs to formalize the program. That means regularized briefings, tiering the analyst for levels of engagement that they feel are necessary, regularized feedback from the analysts and, if they want to be truly bold, an analyst “summit” or at least a “day.” They do some of that as spot work – i.e. their hospitality suite around Dreamforce, but they are well beyond that. Scott stays very personally active – kudos to him for that. But, even as that continues, Xactly needs to be more aggressive with the analysts they work with and in discovery of the influencers they don’t. This is a company with both current upside and promise. Five years from now, I expect that they will still be having impact, but on a much bigger scale. I do.